Duke Homestead and Tobacco Factories, 1890s. 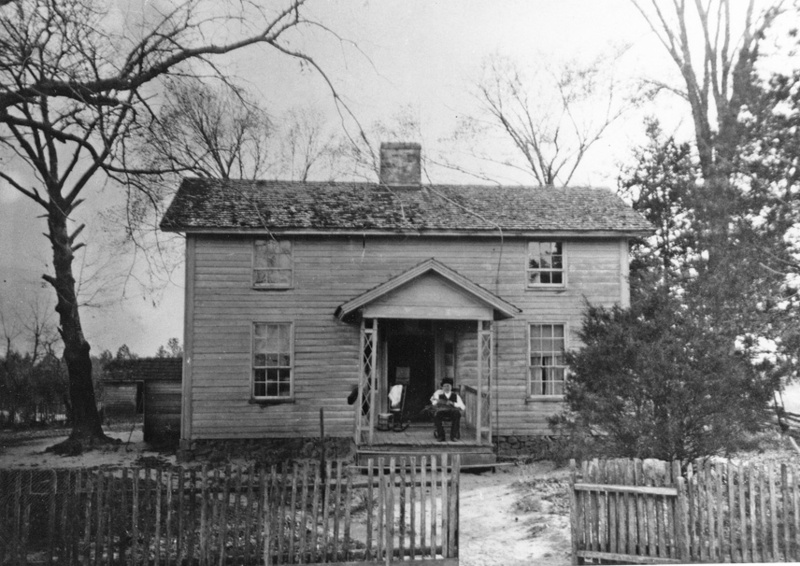 Washington Duke, born in 1820, grew up on the farm of his parents, Taylor and Dicey Duke, located on the Little River. He was 'converted' to the Methodist church as a young boy at Mt. Bethel church and became a lifelong proponent of Methodism. 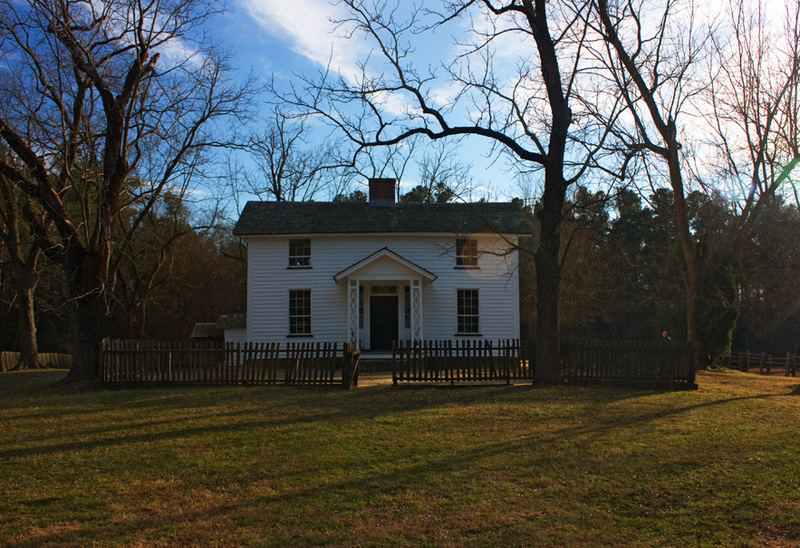 He moved out on his own and became a farmer in his own right, renting land at first, but receiving some land of his own from his father-in-law when he married his first wife, Mary Caroline Clinton. He had two children with Mary Duke: Sidney Duke (who would die from Typhoid Fever at age 14) and Brodie Duke. Mary Duke died of Typhoid fever in 1847, when Brodie was 1. 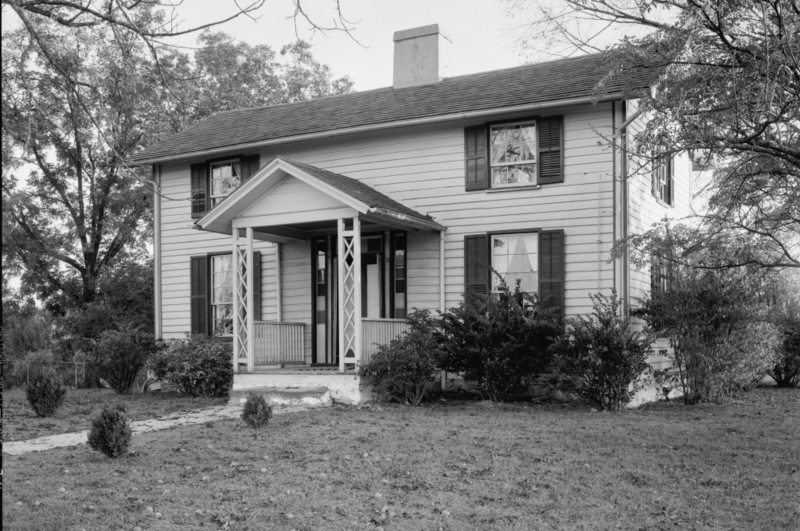 In the early 1850s, 'Wash' built a small frame house on his land, and brought his second wife, Artelia Roney, to this house in 1852, along with Brodie and Sidney Duke. Artelia and Washington Duke had three children while living in the house - Mary, Benjamin Newton, and James Buchanan. 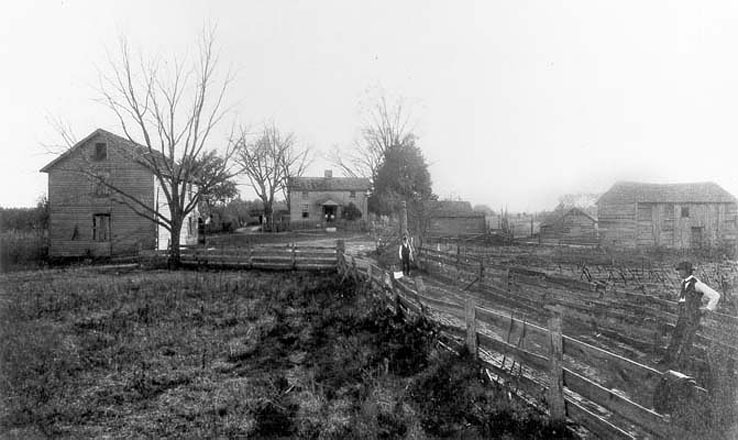 The farm consisted of approximately three hundred acres when Washington Duke left to fight with the Confederate Navy. He was imprisoned briefly at the end of the war, and walked home from New Bern, NC upon his release. Upon his return from the war ( "with two blind mules and 50 cents") he found his farm had been stripped by Union soliders, with the exception of some leaf tobacco. He pulverized the tobacco, placed it into sacks, and departed the homestead in his wagon, selling tobacco across the state. He began to grow leaf tobacco and built a small, single-story log barn as his first tobacco factory, soon accompanied by a second, larger frame factory. He continued to build additional structures on the farm as his tobacco manufacturing business began to take priority over tobacco farming. Brodie Duke was the first of the Duke clan to move to Durham, establishing a factory in Durham in 1869. He persuaded Washington to come as well, and they established a joint factory on West Main St. in 1874. Washington Duke built a house in Durham near the later Cigarette Factory by the 1870s, facing the railroad tracks. By the 1880s, he had built a large home near the southeast corner of S. Duke St. and West Main St., which he named Fairview. The family, particularly Washington Duke, continued to return periodically to Duke Homestead for visits until his death in 1905. The property was acquired by Duke University in 1931 - after the deaths of JB Duke and BN Duke. it became a National Register landmark in 1966, and was deeded to the State of North Carolina in 1973. It became a State Historic Site, and is open to the public for tours.